For most of us, we see these unusual vegetables at the grocer but don't know too much about them. Learn how to grow and cook these vegetables. 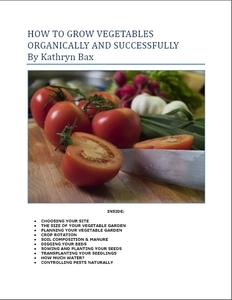 If you need information on how to grow vegetables in general we have that too. 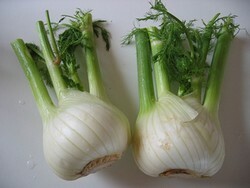 Fennel, for example, also called finnocchio in Italy are fleshy leaf stalks that after blanching are delicious cooked in stock in a casserole and served with a creamy sauce, or they can be boiled in water and covered with a cheese sauce. 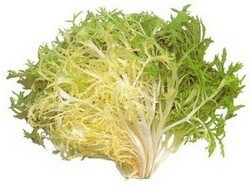 The tender, inner sections may be sliced thinly and added to salads. Fennel needs rich soil and plenty of water in drought, but given this and a sunny position, the plants come readily from seed sown outdoors in drills 18 inches apart from April - August if you live in the northern hemisphere, for succession, the seedlings being thinned to 9 inches apart. Blanching is not difficult. When the base of the stems swell they should be partially covered with soil 3-4 weeks before required for use. Another unusual vegetable which is popular on the Continent is the purple or pale green Kohl Rabi which is similar in flavor to that of the turnip with and added 'nuttiness'. It is, however, hardier and more drought-resistant than the turnip, and plants thrive in almost any garden soil sown from April - June in rows 18 inches apart, spacing the seedlings 9 inches apart. The edible root which grows above the surface should be used when the size of cricket balls. Roots from late sowings can be left in the ground during the winter and pulled when required. 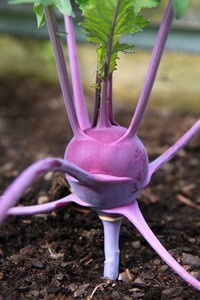 Other unusual vegetables are Salisfy, Endive and Chicory. Both Endive and Chicory do best in deep, medium to light soil, preferably manured for a previous crop. They are interelated with the root variety being called chicory and the leaf variety called endive. A curled variety of Endive (shown left and sometimes mistakenly called chicory in the United States) should be sown in July in rows 15 inches apart for autumn and winter salads, thinning the plants to 12 inches apart. In August, the hardier, broad-leaved Batavian variety may be sown for later use. When nearly fully grown the hearts must be blanched. The simplest method of doing this is to cover the plants when dry with white-washed cloches or with inverted flower pots, placing a stone over the drainage hole of the pot to prevent light from getting through. The length of time the plants should remain covered varies with the season, but, roughly, plants blanched in autumn are normally ready for cutting in 10 - 14 days. Those blanched during winter take a little longer. Chicory, is another usual vegetable used in salads and cooking. As mentioned above, people often confuse chicory and endives. This is the root variety. Chicory is sown in May and June in drills 12 inches apart, thinned to 9 inches. In November when the leaves die down, the roots are lifted, and the remaining leaves and side shoots trimmed back to within an inch of the crown, before storing in sand in a cool, frost-proof shed. Forcing leaf growth for salads takes approximately four weeks in a temperature between 50 - 55 degrees. To ensure a regular supply from November to May the roots acan be planted in large pots of damp soil (crown above soil level) and covered with an inverted flower pot, at weekly intervals. The roots are also used. When dried they can be ground and used as a coffee. As for Salsify, or the "vegetable oyster" as it is sometimes called as it tastes like oysters. Although this looks like an unusual vegetable it has been used as such in Europe for the last 500 odd years. For those who enjoy something different this is well worth growing for the roots are excellent as a winter vegetable, or left in the ground until spring, the stems may then be blanched and cooked like asparagus. Just don't overcook this delicate vegetable as it can turn to mush very quickly. Light, sandy soil, manured for a previous crop, is most suitable; or a complete fertilizer may be added before sowing the seed 1 inch deep in April, in drills 15 inches apart, thinning the seedlings to 6 inches apart. There is both white and black salsify. The picture shows the black variety which looks like a long, untapered black carrot. White salsify is shorter in length and the roots are forked with small hairs. Hopefully we have inspired you to think about planting some of these more unusual vegetables for your own vegetable gardens this season. Add your Own Comments on Unusual Vegetables here! Do you have other unusual vegetables you would like to talk about here? Tell us what they are, how you plant them and how you use then. Or perhaps you would like to add to the information above.